Ivanka Trump kicked off a global business summit in India Tuesday. President Trump's daughter and senior adviser gave the keynote speech at the Global Entrepreneurship Summit in Hyderabad, an event the president said would highlight "the growing economic and security partnership between our two nations." Ivanka Trump's visit as the head of the U.S. delegation has also drawn attention to the family's business interests in India, which go back several years and can be seen in Trump-branded properties scattered around the country. "The Trump Organization is currently involved in five properties in India which are under various stages of development," a company spokesperson said in an email to CNNMoney. The deals were reportedly inked before Trump took office and transferred the Trump Organization's operations to his sons, Donald Trump Jr. and Eric Trump. Ivanka Trump resigned from all positions with the Trump Organization in January. A gleaming gold Trump Tower in India's financial capital has been under construction since 2013 and is expected to be finished in 2018. Trump does not own the property, but has licensed his name to the developers, Mumbai's Lodha Group. Apartments in the 75-story tower -- located in the city's upmarket Worli neighborhood -- start at 73.5 million rupees ($1.2 million), according to Lodha's website. Owning one also gives you access to around half a dozen swimming pools, a fruit orchard and even a private jet. 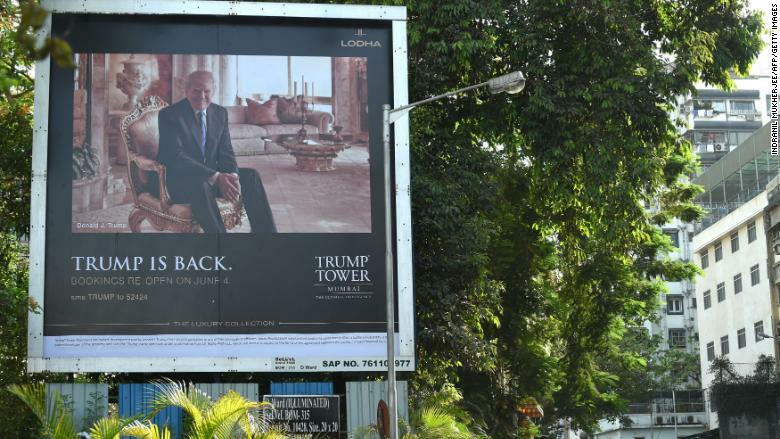 The Trump brand allows developers to increase their asking price by 30%, Prashant Bindal, chief sales officer for the Lodha Group, told CNN in March 2016, before Trump was elected president. "The association that Trump provides is his power," Bindal said at the time. The Lodha Group did not immediately respond to requests for comment on the property on Tuesday. Around 90 miles (145 km) southeast of Mumbai, Pune is home to India's first Trump property. Trump Towers Pune, a pair of 22-story buildings, was built by one of the city's top real estate developers, Panchshil Realty. Panchshil's top executives, Atul and Sagar Chordia, made headlines last year when they met Trump in New York days after he was elected. The Trump Organization downplayed the meeting, saying "no business of any sorts was conducted." Panchshil's website describes the towers in Pune as "upholding the unrivaled standards of the Trump brand." Neither the Chordias nor Panchshil Realty responded to questions about apartment prices, sales and other details about the property on Tuesday. Sagar Chordia told CNNMoney in January that the buildings were "100% ready." Trump has lent his name to two different projects in Gurgaon, an industrial and tech hub on the outskirts of Delhi, according to Indian media reports. The first, a residential complex next to a golf course, is being constructed by a company called M3M India and will feature more than 200 apartments priced at around 120 million rupees ($1.8 million) each, according to local media. The second project, an office building, is being built by Gurgaon developer Ireo at a reported cost of over $150 million. The deal was announced in April 2016. Representatives for Ireo could not be reached for comment on Tuesday. M3M India did not respond to requests for comment. Described on its website as a residence for "connoisseurs of refined urban living," Trump Tower Kolkata is being jointly developed by three real estate firms, Unimark, the RDB Group and Mumbai-based Tribeca Developers. More than half the apartments in the building were sold since mid-October during a soft launch of the development, according to a report in India's Economic Times newspaper. Unimark declined to comment on the Kolkata property on Tuesday. RDB Group did not immediately respond to a request for comment outside business hours. Kalpesh Mehta of Tribeca, which calls itself the "exclusive Trump representative in India," declined to comment on any of the company's businesses in the country. -- Manveena Suri contributed reporting from New Delhi.